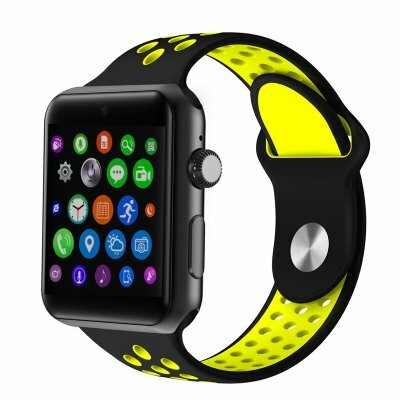 Successfully Added DM09 Plus Smart Watch Phone - 1 IMEI, Pedometer, Calls, SMS, Social Media Notifications, Bluetooth 4.0 (Black + Yellow) to your Shopping Cart. Enjoy great connectivity from your wrist with the DM09 Plus smart watch phone. This phone watch features a SIM card slot and 1 IMEI number. Thanks to this, it allows you to use all your regular cell phone features straight from your arm. Make calls, send messages, and receive social media notifications – nothing is too much for this Bluetooth watch. With its stylish design, this smart watch can be worn with confidence at any occasion. Whether you use it at the gym or at work, the DM09 Plus Bluetooth watch is guaranteed to go well with your outfit. On its 1.5-Inch OLED display, it treats you to bright visuals that can be enjoyed throughout the day. This smart watch phone furthermore comes with plenty of health and fitness features that help you work towards a healthier future. With a pedometer in place, it keeps you constantly up to date about the number of steps you took throughout the day. Thanks to this, you can be guaranteed that you’ll always meet your daily exercise levels. It even comes with a sedentary reminder to make sure you’ll never miss out on your workouts again. By packing a powerful 350mAh battery, this sports watch allows you to use all its features for up to 30 hours. All this power will get you through multiple days without needing to worry about recharging your phone watch. This watch phone can even be used without inserting a SIM card thanks to its Bluetooth support. Simply synchronize it with your iOS or Android phone to use all their features on your wrist. With its built-in microphone and 1W speaker, you can make and answer calls at any time of the day. Your Bluetooth watch furthermore lets you write messages and listen to music. Whether you sync it with your smartphone or insert a SIM card, this watch phone will always keep you within reach for friends and family. From now on, you can be guaranteed that you’ll stay connected no matter where you’re at. This smart watch phone comes with a 12 months warranty, brought to you by the leader in electronic devices as well as wholesale electronic gadgets..
Arabic: - الهاتف الذكي - Chinese Simplified: - 智能手表手机 - Czech: - Chytrý telefon hodinky - Danish: - Smart ur telefon - Dutch: - Smart Watch Phone - French: - Smart montre téléphone - German: - Smart Watch Phone - Hebrew: - שעון חכם טלפון - Hindi: - स्मार्ट घड़ी फोन - Italian: - Orologio Smart Phone - Japanese: - スマートな腕時計の携帯電話 - Korean: - 스마트 시계 전화 - Malay: - Telefon pintar Watch - Norwegian Bokmål: - Smart ur telefon - Romanian: - Ceas smart telefon - Russian: - Смарт-Смотреть Телефон - Spanish: - Teléfono del reloj inteligente - Thai: - โทรศัพท์สมาร์ทวอทช์ - Turkish: - Akıllı seyretmek telefon - Vietnamese: - Smart Watch điện thoại.